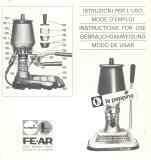 FE-AR, founded in Milan by Felice Arosio, has been produced almost 30 years from the late 50's to the mid 80's. The only model is that of a lever machine, minimalist in design and function. It was also marketed by Carimali with the name of Piccolina. The design of the machine has remained the same throughout the years with a few minor variations in cosmetics. The early models had a more bulbous kettle which eventually gave way to a more angled geometric kettle in later years. In 1980 the Termomatica model was introduced with a thermostat and double switch. The Peppina has an open boiler with a lever, spring and piston mechanism. By pushing down the lever, the spring and piston are depressed allowing a cylinder to fill with hot water. By letting go of the lever, the spring/piston then presses the hot water through the coffee grounds. The result is a very good espresso. It is the lightest lever machine manufactured, weighing 7.7 pounds (3.5 kilograms). It can be easily disassembled in minutes and has just a few parts. Being lightweight, none of the parts have a feeling of strength and durability, but yet the machine has performed admirably over the years with many still in use today. The charm and beauty of the La Peppina is in the genius and originality of the whole machine. Beautiful, simple and easy to use. It easy for us to forgive any shortcomings it may have. © 2009-2014 Francesco Ceccarelli. All rights reserved.